Using the browser extension will increase automatic (background) sync frequency. You can also manually import / export projects at any time in-bulk by going to the Projects Tab, clicking the Basecamp logo and selecting import or export. Sync All. 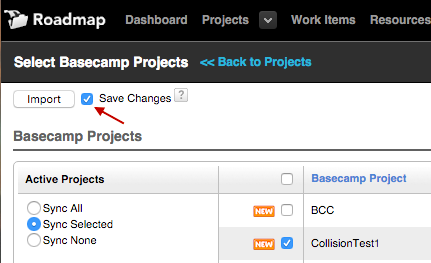 Automatically includes new projects as they are created in Basecamp. Sync Selected. New projects created in Basecamp not automatically included. Select "Save Changes" so the system will remember the changes. If the project you're looking for is not listed, then the Basecamp credentials used to integrate with Roadmap do not have access to the project in Basecamp. Note: If you delete a project in Roadmap that was imported from Basecamp, it will be marked as excluded (so that it doesn't "show up" again in Roadmap). Projects marked as excluded will have a red X in their checkbox. Roadmap admins can clear this exclusion. Roadmap syncs with Basecamp using the credentials of a single Basecamp user. We recommend that this user be the Basecamp Account Owner. If the Basecamp user -- whose credentials were used to integrate with Roadmap -- does not have access to the project in Basecamp, then Roadmap will not "know" about the project. If you have multiple logins (identities) for your Basecamp account, take note of which of those Basecamp identities you are logged into when integrating with Roadmap. If you are the Basecamp account owner, be sure to use that identity when integrating with Roadmap. Remember that not every Roadmap attribute gets exported to Basecamp. For example, resource allocation (time) estimates and custom project attributes are not exported to Basecamp; and only one resource assigned to a milestone -- the flagged one -- is exported. If connecting to a different Basecamp account, be sure to logout of the old Basecamp account. In Roadmap, go to Connecting Applications > Basecamp and click "Change". On ensuring screen, click "Yes, I'll allow access". In Basecamp Classic, go to "My Info", scroll down and click "Show your tokens"
In Roadmap, go to Connecting Applications > Basecamp and confirm the tokens match. If not, update Roadmap with the correct token. A less common problem is that your Basecamp Classic site address has changed, and thus Roadmap needs to be updated. The final item to mention (it's happened more than once :)) is that synchronization will fail if your Basecamp account has been canceled (even unintentionally, or by someone else in your organization).